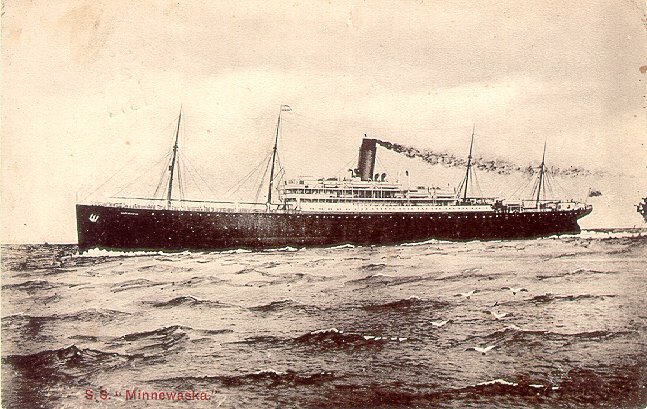 Built by Harland and Wolff of Belfast, Atlantic Transport Line's third Minnewaska was launched in 1908 and made her maiden voyage from London to New York on 1 May 1909. She made her last sailing on that route in January 1915, and was then converted into a troop transport. While serving in that role on 29 November 1916, she struck a mine laid by UC-23 in Suda Bay and was severely damaged. She was deliberately run aground in the hope that she could be salvaged, but the damage was too extensive and she was declared a total loss. At the time, Minnewaska was carrying 1,800 troops, plus crew. There were no fatalities. 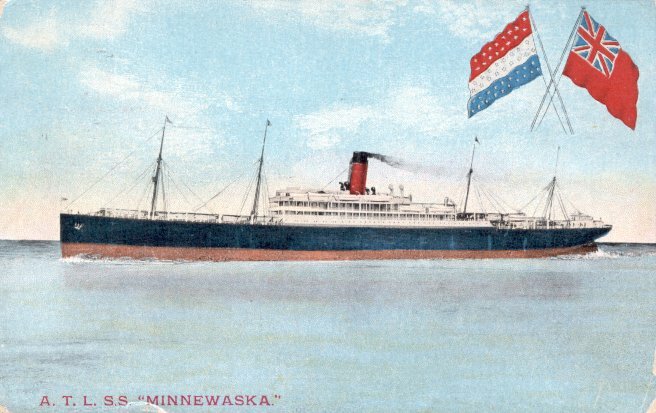 Minnewaska was broken up where she lay beginning in 1918. Sources; Bonsor's North Atlantic Seaway; Haws' Merchant Fleets; Williams' Wartime Disasters at Sea.